I've applied for a Schengen visa through the German embassy (I'd write about it but they're changing the visa application process starting August 1st 2015 -- so my would-be post on the experience would be outdated) and a U.S. visa through the U.S. embassy, and both were quite difficult in the sense where, yes the requirements were easy but convincing them you won't illegally live and work in their country was the tough part. 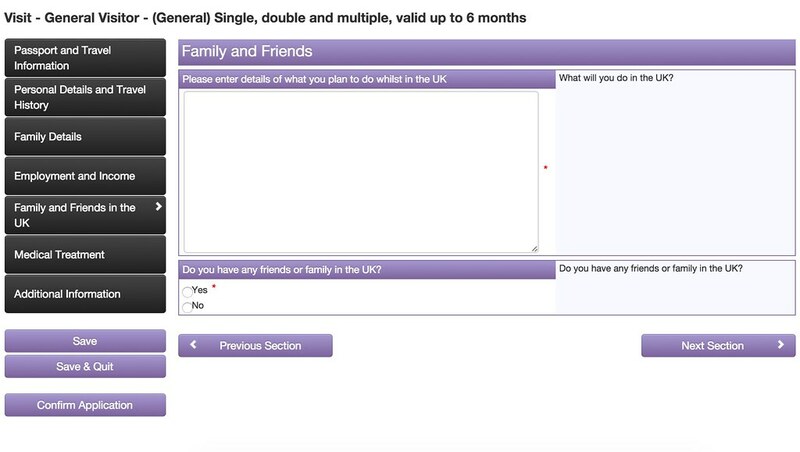 I found that the U.K. visa application process was the least stressful of the three. I kid you not. 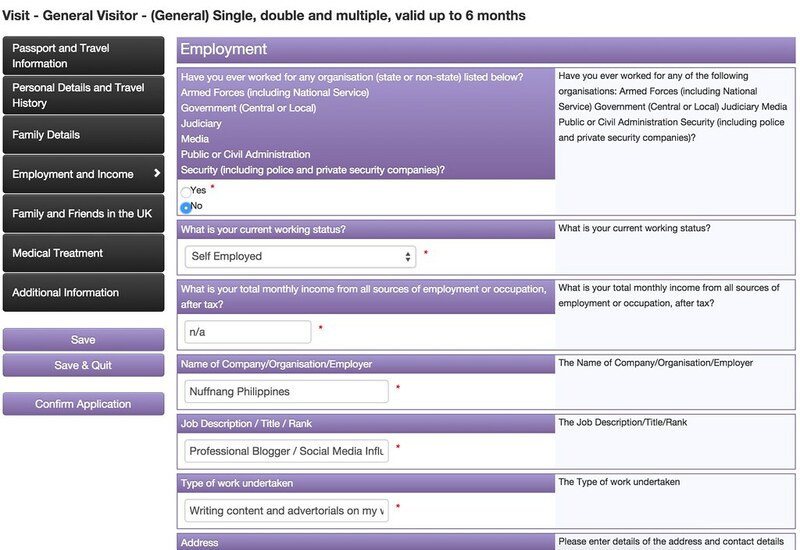 It's also quite easy, you just need to be extremely detailed with your application because there's no interview. Let me take you through the step by step process that I went through. The website for filling up your visa application form can be found H E R E. You need to register an account because this is where your entire application and process will be kept on record for you to edit and keep coming back to as you please until you're ready to book your preferred appointment, pay the fee (currently at 133 USD) and print the application for when you need to submit them in person. July marked 3 months before my trip, so I started filling up my application form mid-June, giving myself time to really iron out all the details and gather all the documents I needed. Be honest with your application form! Fill up your form with all your details, if you're not sure with some, you can skip them and continue on. Always save your progress because sometimes PH internet isn't reliable. I've lost my progress once or twice and had to re-do some sections. Because I work as a freelance blogger, I was honest about my monthly salary being "not applicable" due to the fact that as a freelancer I don't get a monthly salary. I will later on state that I'm attaching a letter of certification from my agency listing down my on-going projects to give the embassy/consuls an idea of how much I've been making this year, even though I don't technically have everything in my bank account yet. After my breakdown of my expenses, I also stated that my grandfather will be helping fund my trip as a sponsor. All visa applications are a case-to-case basis and as I've mentioned earlier it's so important to BE HONEST. As a freelancer, my bank account doesn't always mean I'll have six figures in it. 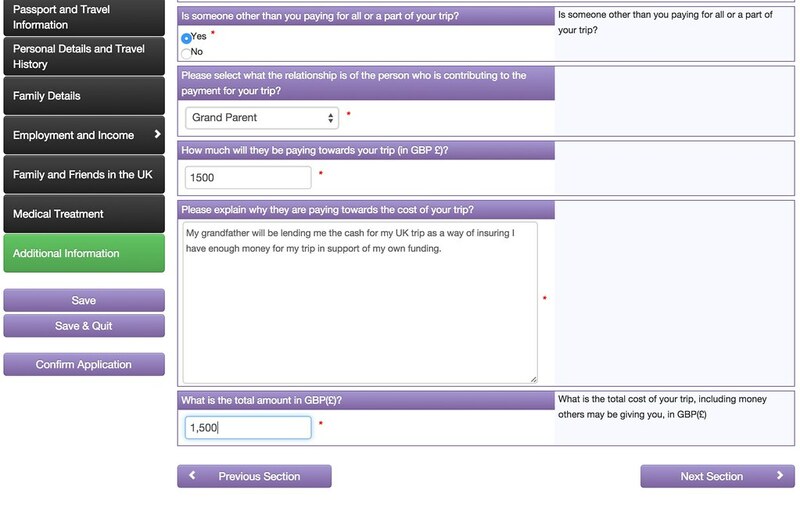 It's true, the cost of my UK trip will personally cost me around 1,000 - 1,500 GBP. But during the time I applied, a lot of my pay checks haven't come through. And so, I took the resourceful route and asked my grandpa if he'd be willing to lend me money for the trip just in case my paychecks don't clear in time, and if they did, I would have extra cash sitting in my bank account in case anything happens. He agreed. Yes, my entire Eurotrip is being funded by myself, but stating I was being "sponsored" isn't a lie either... It's just another way of telling the UK embassy that "Hey, I can afford to go to Europe (remember when I said earlier in this post that I had my agency write a letter with a list of my projects and earnings for the last 6 months? That's how I proved I can afford the trip myself without needing to show my bank account), but my grandpa is also lending me extra money just in case what I have isn't enough. You need not worry." Before submitting your application, you get a chance to include any other information you wish to be considered as part of your application. I requested for a multiple entry visa and they actually gave it to me, so now we know they really do take into consideration whatever you put in this box. Before confirming your entire application form, make sure you have everything right. Once you've clicked 'confirm' and digitally signed the form, you can no longer go back and edit it, you'll have to start a whole new form all over again. When you're absolutely sure there are no more details you need to fix or change, you can go ahead and confirm, then you can pick your appointment schedule at VFS Global and then proceed to pay your visa fee either online via credit card or bank deposit. You will NOT submit your documents at the UK Embassy. VFS Global is the official agency (or middle-man) where you submit your documents. They have NO hold on whether you get granted a visa or not. They may ask you questions, but this is just to clarify the information you've placed in your forms. They will also take your biometrics which means a photo of your face + fingerprints. I had no idea that the photo they'd be taking that day would be the one they'd place on my visa. Thankfully, I did my makeup well that morning. There is NO interview process unless the UK Embassy decides they want to see you and talk to you in person, but this rarely happens. I believe cases like this are for people applying for other types of visas. This is why you need to be as detailed as possible in your application because this is where you will be judged by the consuls at the embassy. It took 7 business days for my visa to arrive. A visa does not guarantee entry to the destination country which is why I've been emphasizing honesty in applying for visas and the reason for this is because the deciding parties for the visas and immigration at the airport are TWO ENTIRELY DIFFERENT SECTORS. What you present to the embassy must match what you will have to present to the immigrations officer should he ask for proof before you enter their country. And believe me, coming from the Philippines, you can be 90% sure they will ask for proof at immigration. (It happened to me when I landed in Germany in 2013) Just because an embassy grants you a visa does not give you the right to enter a country. An immigration officer at the airport is the final judge. 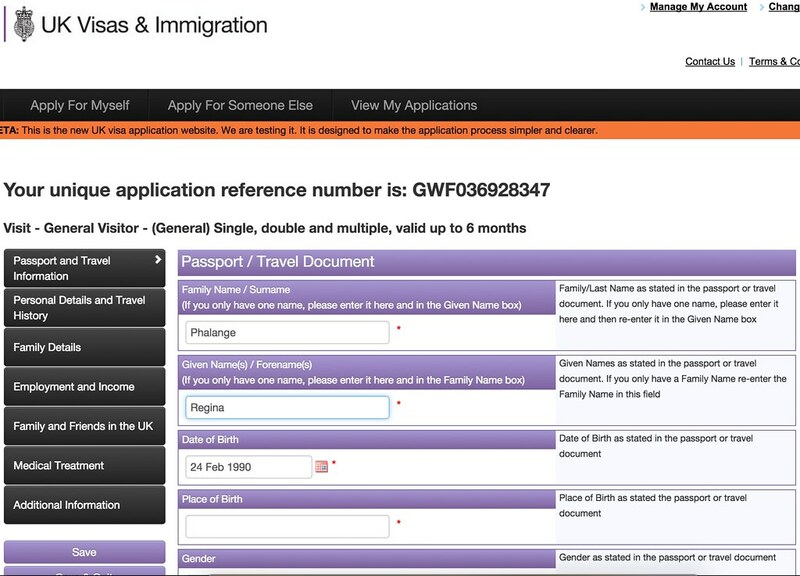 If you lie in your application, you could get caught at immigration.For example: You're not confident about your bank account and so you decide to just lie in your application and state that you're being sponsored by someone. This makes the embassy think, "Good, so you have funds and a means to survive in the UK/Europe/US." and they grant you a visa. In reality, this person can't sponsor you but you're hoping your Php 30,000 will be enough for that 2 week trip (Hint: Unfortunately it's not enough for two weeks. 30,000 will only cover the costs of 1 week accommodations, transport and food) Great right? You got a visa! Woohoo! So on the day of your trip, you arrive at Heathrow airport and an immigration officer decides to check if you actually have the funds for your two week trip. He asks for proof of cash on hand, bank statement, hotel bookings, credit cards, tickets to tours and attractions... But all you have to show is the Php 30,000 in your bank account. This is a red flag because realistically you can't survive on Php 30,000 for two weeks. He can deny you entry and send you home. Your trip is over before it could even really start. There is no fixed amount required in your bank account.You just have to make sure that your itinerary fits your budget. Don't claim to book five star hotels when your budget for the trip can only really afford hostels. The money you have in your bank account should match accordingly to your budget and travel lifestyle. My budget for my 10-day trip is Php 100,000 (including airfare). I included in my application that I will be staying in hostels (cheap accommodations that come with a free breakfast), and most of my tours will be sightseeing or free museums. London is highly expensive, but budget traveling IS possible anywhere, so keep it realistic. Do your research. It's tedious but it will pay off if you can get details right in your application form. These consuls are experts and are trained to know what makes sense in itineraries and what doesn't. 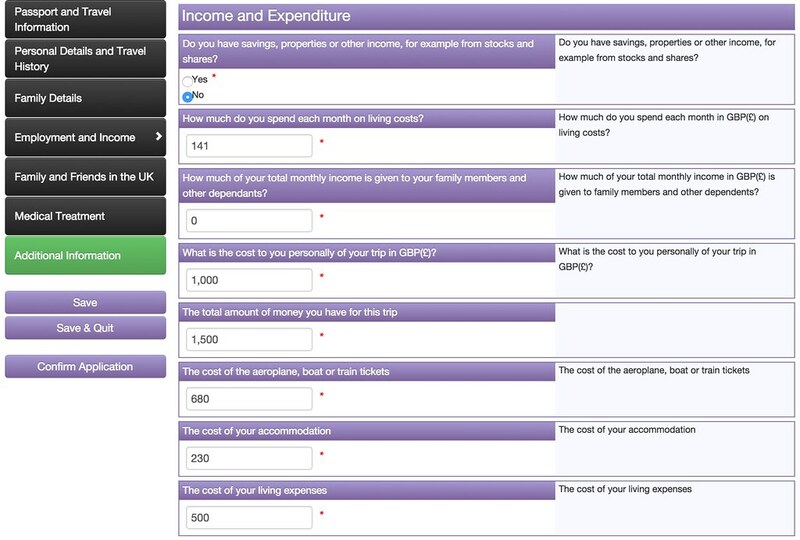 To get an idea of how to create your budget for the trip, Google articles on the cheapest accommodations, daily transportation costs (tube, busses) and how much each of your meals might cost (breakfast, lunch, dinner) per day in the UK, then multiply it by the number of days you plan to stay there. Don't forget to include the cost of tickets for some tourist attractions you want to see. 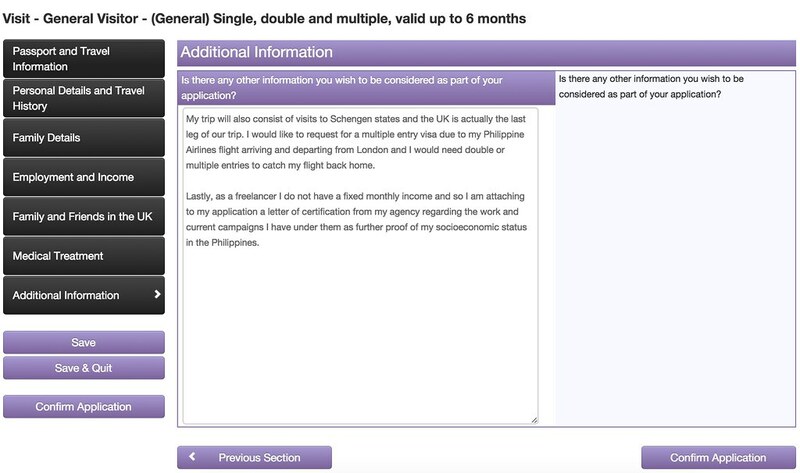 I hope my long blog post will help enlighten you regarding the UK Tourist Visa process! It was the most stress-free visa process I've experienced so far... I'm actually going through another visa process in two weeks at the French embassy and hopefully that one goes just as well!